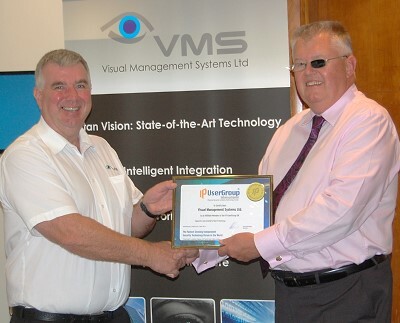 John Downie, Sales Director, receives the membership certificate from Paul Hennings Principal at IP UserGroup Int. at the IP-in-Action LIVE Event in Portsmouth. The IP UserGroup is an International Security and Safety technology forum with hubs servicing the UK & Europe, USA & Canada and Latin America. It's role is to Facilitate, Communicate, Educate and Influence, presenting the very latest in network centric security and safety technology to an eager International Audience. John Downie commented, "I have followed the fortunes and activities of the IP UserGroup here in the UK for many years and am delighted to become involved". He added "We intend to be very active within the forum and having already participated at the Portsmouth road show event, we look forward to the forthcoming show in Bristol in December".